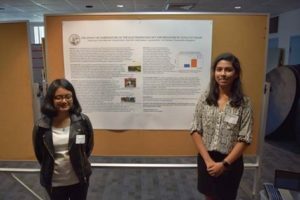 Sreyashi Ghosh and Simran Kaur, two high schoolers, stand in front of the poster detailing their experiment on The Electrophysiology of Venus Flytraps, at the ASPB Mid-Atlantic chapter conference in Baltimore, Maryland. In a collaboration between researchers at the Princeton Neuroscience Institute and Princeton Public Schools, with support from an ASPB BLOOME Grant, we began an outreach project to teach elementary school students about the electrophysiology and behavior of Dionaea muscipula, commonly known as the Venus flytrap. The Venus flytrap (VFT) is a part of the Droseraceae family, which includes several types of carnivorous plant–including water wheels and sundews. It originally grew in a region of North and South Carolina along the Atlantic Coastal Plain, where summertime temperatures usually fluctuate between about twenty and thirty degrees Celsius. Inside each VFT leave are six trigger hairs, three on each side. If one or more of these trigger hairs, which function as sensory organs, get triggered twice within a given time interval (usually 20 seconds), a calcium dependent electrical impulse travels up the plant, causing the trap to shut. Once closed, it forms a ” green stomach, ” releasing digestive enzymes into the trap to digest its prey. After it is done collecting nutrients, the Venus flytrap opens, allowing the remaining carcass to fall or get washed away. Studies have found that trap activation is triggered by the calcium dependent spike, but not much is known about how trap activation can be physiologically modulated or the effects of modulation. Thus, we created an experiment to see how the Venus flytrap reacts to changes in temperature within the usual summertime parameters. We found that an increase in temperature, especially above thirty degrees Celsius, caused the plant’s memory to be prolonged, which may not be efficient for the plant because of the excess energy expenditure from closing due to a “false alarm.” Additionally, we noticed that the amplitudes of the action potential structures varied based on the ambient temperatures. We are so thankful to have had the opportunity to present our research at the ASPB Mid-Atlantic conference as high school students. It was insightful to hear about others’ research through lectures and poster presentations. Additionally, it was exciting to share the research we have conducted with others to receive advice and critiques–including with Sally Mackenzie, the President of ASPB. 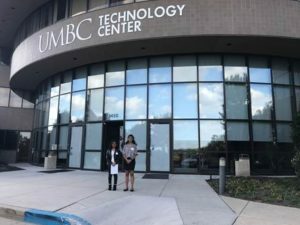 Simran Kaur and Sreyashi Ghosh, two high school presenters at the ASPB Mid-Atlantic chapter conference in Baltimore, Maryland conference, pose in front of the UMBC (University of Maryland Baltimore County) Technology Center. In general, researching Venus flytraps has been an enlightening experience. While this process has been long and enduring, the results are worth the effort. All of us are part of a research program at Princeton High School (run by Jacqueline Katz and Jennifer Smolyn), through which we were given the opportunity to work with Mark Eastburn from Riverside Elementary School and Joel Finkelstein from the Princeton Neuroscience Institute to investigate Venus flytraps. All of us were surprised to learn that there has been minimal research on these plants thus far. As students, we were particularly surprised that plants can serve as models for neuroscience. This fascination provoked us to learn more. We didn’t want to stop at enriching ourselves, because neuroscience and botany literacy are often overlooked topics in school. Hence, we wanted to expose younger children to these topics through hands-on lessons; we taught elementary kids at Community Park School about this project. Mr. Eastburn integrated VFTs into Riverside’s science curriculum, and we are continuing to expand this outreach program at the Henry Pannell Learning Center and at the Cranbury Public Library. Hopefully, we can make younger children as excited about neuroscience and plant science as we are!